Please arrive at the meeting point 10 minutes before the tour begins. The activity takes about three hours, but the whole guided tour can be finished in 2.5 hours depending on the size of the group. We run this tour all year-round. No matter the season, we will be waiting for you at the meeting point. In case of heavy rain or snow, the tour will be canceled. In this case, we will contact you to reschedule the activity. You need to have your ID and the confirmation email with you upon arrival. We recommended you wear comfortable shoes and bring a bottle of water. Don’t forget your photo or video camera. Itinerary may change from time to time. Madrid’s street art comes and goes all the time! Thus, the street art bike tour may change its path based on recent additions or changes to the art. 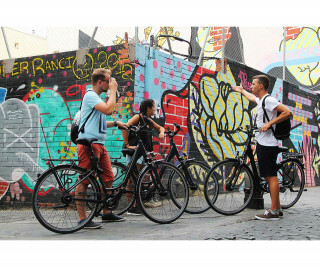 Our Street Art Bike Tour is the only of its kind in Madrid. 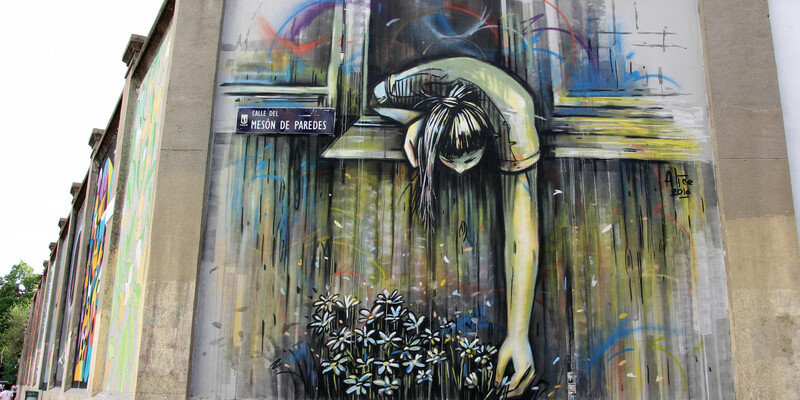 We take you around the top spots to introduce you to the best of the Spanish street art scene. Whether you call it “independent public art", "post-graffiti", or "neo-graffiti", we can agree on one point: street art is getting extremely popular in Madrid. Neighborhoods like Lavapiés, Embajadores, and La Latina are good examples of this trend. Impressive artwork can be found in almost every corner of these areas. We run this activity twice a day all year-round, at 11:00 a.m. and 5:00 p.m. You meet your guide in front of Carrefour Express, at Calle Montera 32. It is easy to find her, as she carries a Street Art Tour banner. As you pedal along the well-planned path, you can admire graffiti walls, stencil creations, and sticker art. The tour allows you to discover a part of town that’s not usually seen by tourists - in fact, not even locals see all that you do on this tour. You are exposed to true hidden gems of the underground street art culture. 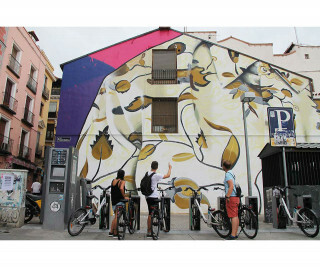 During the tour, you also have the chance to hear about this colorful world from a local graffiti artist who happens to be a frequent collaborator with Calle Lavapies, Urvanity, and Muros Tabacalera street art festivals. Your guide leads the way as you head towards the streets of Lavapiés, where you see graffiti art by some of the city's urban artists. Continuing down the Calle Argumosa and Calle de Embajadores, you can see the impressive painted walls of the former tobacco factory of La Tabacalera. After about three hours of exploring lesser-known neighborhoods, you realize that Madrid is much more than the Royal Palace, Plaza Mayor, and some overcrowded touristy spots. Madrid is also a center of pop culture.